The time has come – shopping season has commenced. If you’re like me, you’ve already started planning your shopping list and have browsed for deals on Black Friday, Small Business Saturday and Cyber Monday. It sometimes feels that the pursuit of the perfect gift is so frustrating but ultimately so rewarding. When you finally find that perfect present and the recipient’s face lights up with genuine joy… is there anything better? You’ve probably heard the old adage “it’s what’s inside that counts.” While this statement is true in most situations, it’s not quite so accurate when it comes to giving Christmas gifts. An amazing gift wrapped in crumpled paper without a tag is so much less festive and fun! This year, make a quick and meaningful tag and attach it to your gift. Let the outside of the present serve as a preview of what’s inside. Gift tags can be made out of everything from polymer clay to cardboard. You can even use yarn and crochet a Crochet Santa Gift Tag that’s so perfect for the season. Best of all, you can save the tag for years to come – it won’t get thrown away when the gift exchange ends. Also consider unexpected embellishments such as silk flowers or colorful buttons for projects such as Flower Christmas Tags. You might think that gift tags aren’t that important, but they’re actually an integral part of this season of giving. 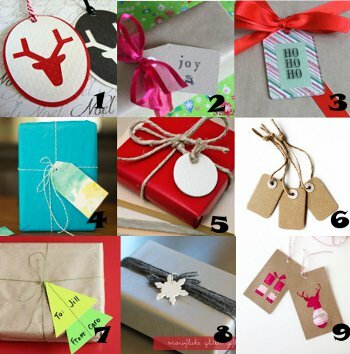 Let your homemade gift tag serve as the icing on the cake for your gifts this season. While they don’t take long to create, gift tags help you keep track of your gift and add a meaningful element to your Christmas presents. Thanks for featuring my fontastic reindeer tags. Love the other designs too! thanks for featuring my toddler tags! You have a great fun blog! Thanks so much for including my polymer clay gift tags. Ho-Ho-Ho!! It is always nicer to receive a gift with a little more thought put into the the presentation. The ideas are really amazing and unique. I love them all thank you so much for sharing this blog.